Registered as a blue roan, called a black leopard by many, Nugget Jim was an impressive 15.3 hand Appaloosa stallion descended from horses such as Kuhalot II, May's Surprise (by Daylight), and quarter horses Old Joe Bailey and Midnight. Nugget Jim was foaled in Kansas, in 1967, and owned by Charles and Doris Caldwell. 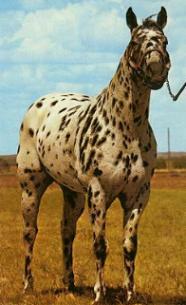 His sire, Spotted Jim, was a proven cutting horse and sire of other halter and performance champions, including Watonga Jim and Jim's Wimpy Too. In 1964 and 1965, Spotted Jim was the Kansas Halter Champion. Nugget Jim was a grand champion at halter and a western pleasure champion. In halter classes, he won more than 75 first places and 40 grand championships, including wins at Houston Livestock Expo and Denver National Western. In 1970, he won 17 consecutive shows. Nugget Jim was 1968 and 1969 Kansas State Champion Stallion, 1970 Oklahoma State Champion, 1970 Golden Spread Champion Champion Stallion, 1970 Golden Spread Jr. Western Pleasure trophy winner. He was a halter champion in five states and went on to sire halter and performance champions.